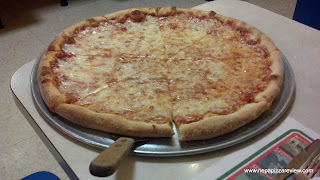 In an effort to spread the wealth and not just review those restaurants in Lackawanna County, I hopped in the car and headed over the county border to Tunkhannock, and drove to the only place I could remember in town - Pompei's Pizza. I'd eaten there several times as a child, but hadn't had their pizza recently, so it was time to brush up on their offerings. Usually when I eat a restaurant's pizza or wings I can remember what it was like for a lifetime (trust me, it's not a gift! I wish I had the same recall abilities in college...) but for some reason I couldn't remember anything specific about this particluar pizza. When the waitress brought it to me it looked well presented. 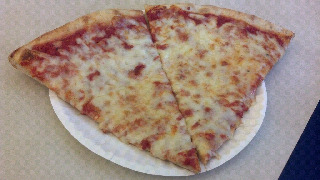 A nice milky mozzerella cheese, a bright vibrant sauce, and a crust which was stretched and cooked properly. It was time to take the taste test and conjure up some of those childhood memories, one bite and...well nothing. The only thing I could think was that I know why I didn't remember anything about it, because there's nothing that really sticks out about the pie. The dough, sauce and cheese work together, but the flavors and textures are so muted that the pizza became boring. The pizza guy was clearly experienced in his trade, as evidenced by excellent craftsmanship, but the tools he is working with (dough, sauce, and cheese) just won't take him over the top. I was satisfied when I finished, but wished there was something more interesting to report. For my second slice, I made things a bit more interesting by adding about a pound of oregano and crushed red pepper. The place has been in business for as long as I can remember, so clearly they are doing something right. I would imagine kids enjoy this pizza, and I'd venture a guess that no one really hates it because it's so - okay. A real middle flyer, but a consistent product. It's a can't miss, a great value for the huge slices they provide, but certainly not a cult classic. BOTTOM LINE: This pizza is what I call a safe bet. It's safe because there is nothing about it that sticks out to make someone love or hate it. If this pizza was a baseball team, it certainly wouldn't be the Yankees - loved by many, but hated by just as many if not more. This pizza would be more of the San Diego Padres - I don't know any Padres fans, nor can I think of any argument as to why someone might hate them. So this is a safe bet (and a good value), a pizza that if taken to a party, people will enjoy it, but no one is screaming, "Hey look, Joey brought the Pompey's!!!" UPDATE: I was at a party where Pompei's steak and cheese stromboli with peppers, onions and mushrooms was served, and it was awesome. They give you a generous helping of steak and toppings inside, and it has great flavor without being greasy. Give this a try!